It is very rarely that Randall lays his programming hands on an “old fashioned and outdated medium” such as paper. He often makes fun of me for even owning pencils and pens (just type everything instead, right?). However, he recently ordered this special moleskin notebook on Amazon along with an architect drafting pencil. He said they were the best and oh so special! He talked it about constantly until it finally arrived, and I asked him what he planned to do with it. If you know my husband, you know he is very motivated-or obsessive- about what he wants. He wants to be his personal best and plans to sleep when he dies. He also apparently plans to be remembered by his contributions and APIs. That’s great! 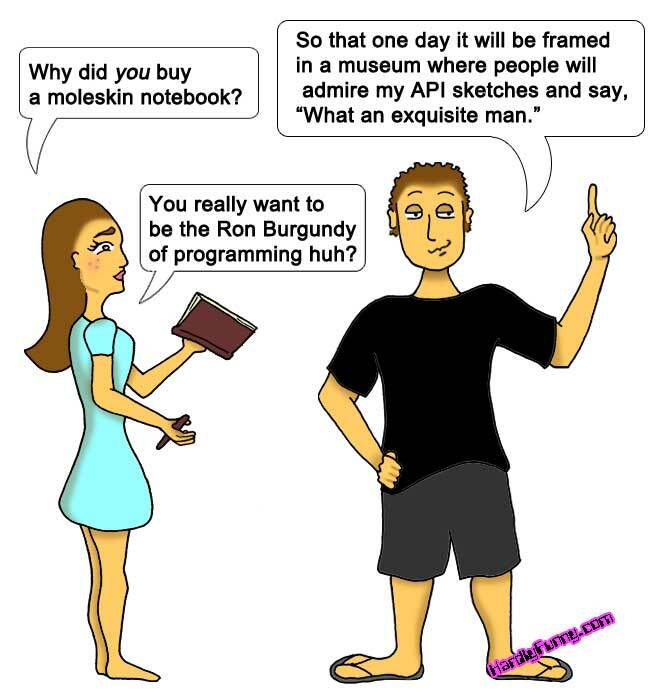 The problem is, I am still wrapping my head around the definition of an API because I’ve never used one personally as a developer. While Randall is very motivating, the things he says are, yet again, unusual and entertaining at times. I do admire his ambitions, and perhaps someday I can fully appreciate his APIs. This entry was posted in Posts and tagged programming by Samantha. Bookmark the permalink.